New from Concordia Publishing House comes Reading Isaiah With Luther. Walk through Martin Luther’s commentaries on the Book of Isaiah with Pastor Brian Kachelmeier, who explains Luther’s interpretation of the conscience and applies it to your life today. The conscience is a gift from God, the faculty of the heart that is to be shaped by what is right or wrong in God’s sight. Only through Christ can you receive a clean conscience, life, salvation, and peace. 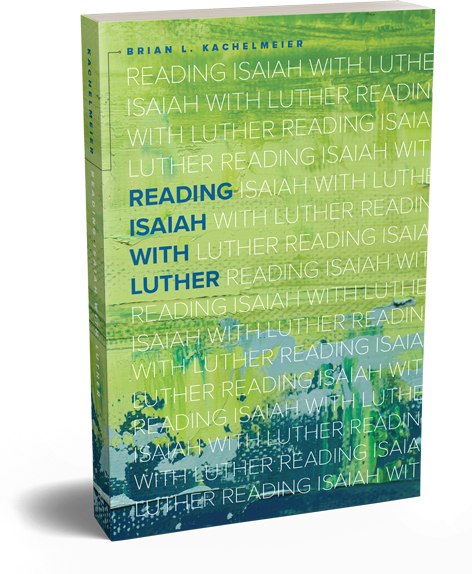 Reading Isaiah with Luther offers highlights from Luther’s commentaries on the Book of Isaiah (where Luther explains the conscience), contemporary applications and explanations, and full-color artwork that helps you pause and reflect on key Luther quotes. Reading Isaiah with Luther, like Reading Romans with Luther, is Luther for everyday Christians. This book offers a nonintimidating way for Christians to study Scripture and learn from one of the great theologians of the Reformation while being guided by a contemporary pastor who helps bridge the gaps between Scripture and Luther, and Luther and contemporary life. —Pastor Bryan Wolfmueller, Author, Has American Christianity Failed? —William Weedon, Chaplain, LCMS Director of Worship, Author, Thank, Praise, Serve, and Obey, andCelebrating the SaintsFor more information on Reading Isaiah with Luther or to order the book, please visit cph.org/readingisaiah or contact Lindsey Martie, Public Relations, by phone at 314-268-1303 or by email at Lindsey.Martie@cph.org. Rev. Brian L. Kachelmeier is pastor at Redeemer Evangelical Lutheran Church in Los Alamos, New Mexico. He is a graduate student in the Doctor of Ministry program at Concordia Theological Seminary in Fort Wayne, Indiana. Kachelmeier has a BA in Religious Studies from the University of New Mexico in Albuquerque, New Mexico, and an MDiv from Concordia Theological Seminary in Fort Wayne, Indiana.